The first class I started here at PBI was titled "This is a book (but maybe not a Codex)" and the instructor was Bill Drendle. The objective of the class was to use book forms and content differently than might be expected, disregarding restrictions of a traditional codex. 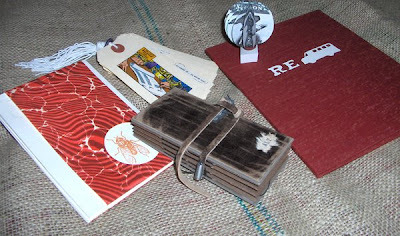 He presented us with found books and comic books, stamps, found papers and objects of all kinds in an attempt to inspire us. We made rebus books using pictures and text, as well as books containing lists and found dialog. In the end, I made five "books". 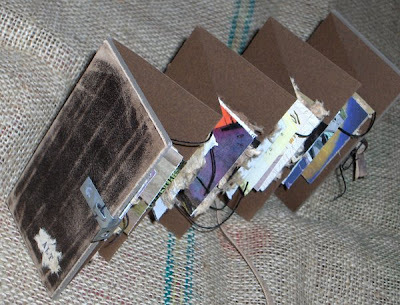 This concertina structure was made to accommodate a list, and I had decided to go with a list of alternative subcultures so the materials and imagery were thus influenced. Another very simple structure he showed us, is this round book made with circles. In my example here, all the circles bear the same image and it sits on a base so you can spin it. How exciting! PBI looks like so much fun. I'd love to attend in the next couple of years. Rhonda, I am sure you are having fun as well as learning a lot. It sounds fascinating! Someday I will try to make a book! I can't wait to see what you bring back to your work! Great books, looks like a very interesting place this PBI. How wonderful to be working with Bill. Your books are fascinating, I look forward to seeing more as the days go by. 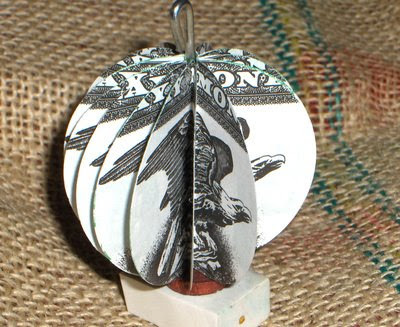 I like your globe book, it would be nice to do a miniature one for the Christmas tree! How is this circle book bound? It looks like a metal bar or something, but could it be bound traditionally? Thanks for the the great reviews and info about your classes at PIB.